In the last decade, a large number of major discoveries have shed light on the molecular mechanisms of lymphocyte migration and the anatomy of immune responses. In T-Cell Trafficking: Methods and Protocols, expert researchers explore how the development of novel and cutting-edge techniques, particularly in the field of real-time imaging and genetic manipulation, have led to an increased understanding of lymphocyte trafficking. Written by internationally recognized experts in their respective fields, chapters provide state-of-the-art protocols to study lymphocyte migration and T-cell: endothelial cell interactions in vitro, address various approaches used for direct visualization of the development of the lymphoid system, lymphocyte recirculation, and effector responses in experimental models in vivo, and explore lymphocyte migration and inflammation in the human system. Composed in the highly successful Methods in Molecular Biology(TM) series format, each chapter contains a brief introduction, step-by-step methods, a list of necessary materials, and a Notes section which shares tips on troubleshooting and avoiding known pitfalls. 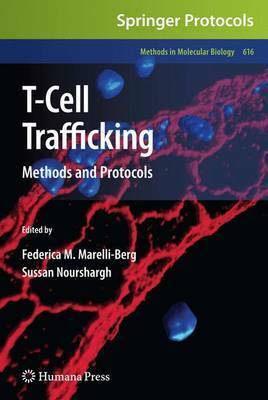 Innovative and highly practical, T-Cell Trafficking: Methods and Protocols is an essential manual for newcomers in this ever-expanding and exciting area of research, as well as a valuable addition to more specialized laboratories.